I haven't exactly kept up on this. I've been following the guidelines (kinda) and attempting to track, but football season is in full swing and you have to have Buffalo Wings during the first game of the season. The tracking app I use doesn't allow you to "skip" a day and pick up again; well, it does but not easily. You can restart, but I don't like a restart, I prefer to pick up where I left off. I've got a couple of other areas to keep me accountable though. My "workout boss" (as Jessie calls her) Anjali got my into the BeachBody Health Bet: minimum of 3 workouts & 5 Shakes each week. Easy peasy. Rocky and I are also tracking our fruits & veggies for the wellness program thru SDSU. Again, my goal here is to make better choices. 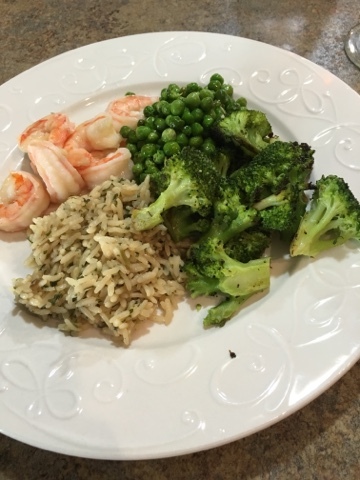 So supper tonight had 2 veggie choices: peas and broccoli to go with shrimp and wild rice (Jessie's favorite). And a glass of wine.